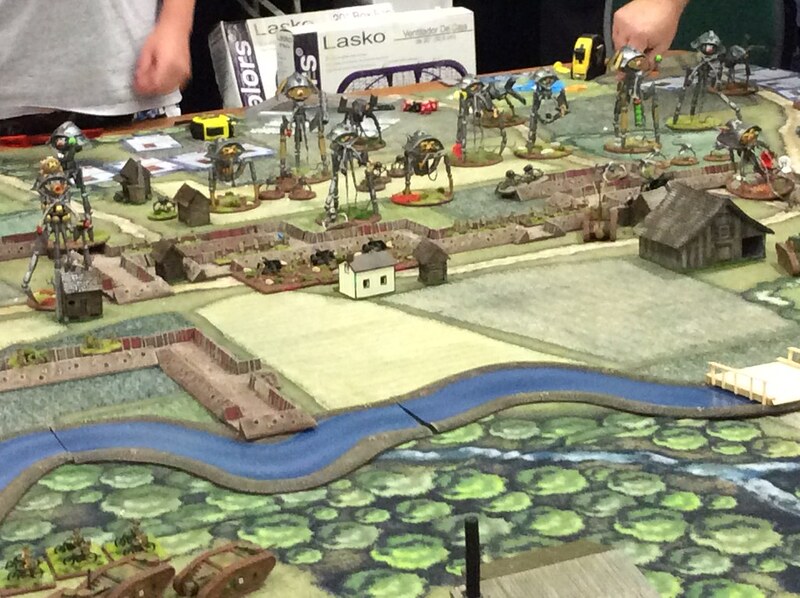 And so HISTORICON, the big Summer show of the Historical Miniature Wargame Society (HMGS) was upon us on July 12. 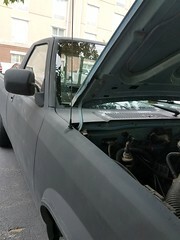 After working a half day, I drove down to Fredericksburg in my ancient Dodge Dakota pickup (painted primer black, you can imagine how fun this was in temps nearing 100 F). My options were few, the van being in the shop. Yes, the inevitable happened while driving a primer black vehicle in 103 degrees. As can happen on the first night, we had our share of crowds– the pre-registration line, of all things, was moving glacially. Eventually everyone got sorted with a minimum of grumbling and people set to doing what the do here, setting up their games or playing pickup games here and there. Here I am, walking around the Exhibit Hall A the night before the convention started. 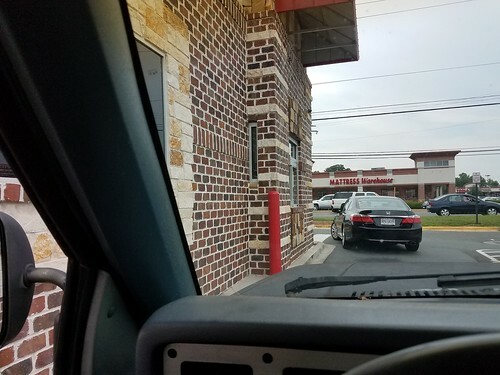 There not being much in the way of dinner options at that time of night, I went to COOKOUT, a local chain I’ve discovered, and had the solitary dining through the car window experience. Cookout. Highly recommended– try the mocha milkshake. Here I am, digressing again. Thursday the convention really began in earnest. I worked the events desk as a volunteer until 1 PM. Business was a-boomin. 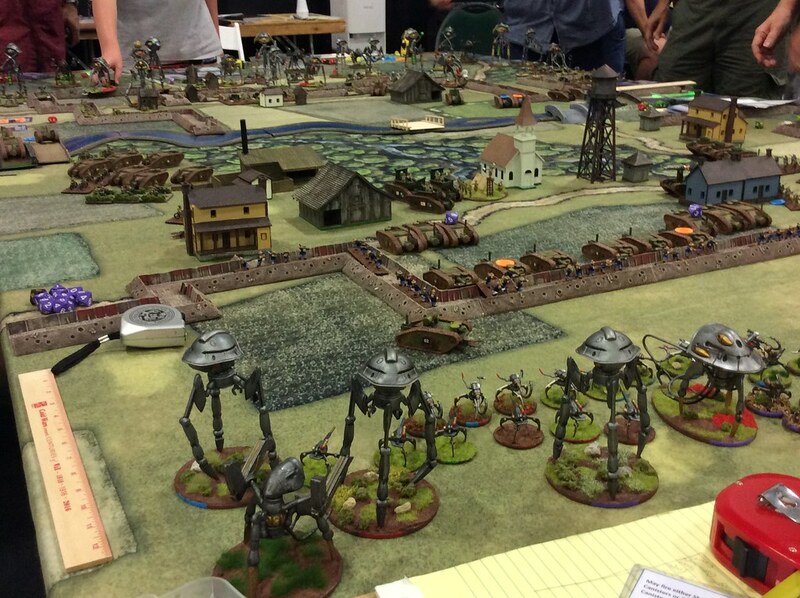 The problem with Historicon in Fredericksburg is there are never enough events for the Fredericksburg space. We ended up pretty much running out of most of them (as in giving tickets out to them) by 2 PM and had Friday’s games out by 4PM. 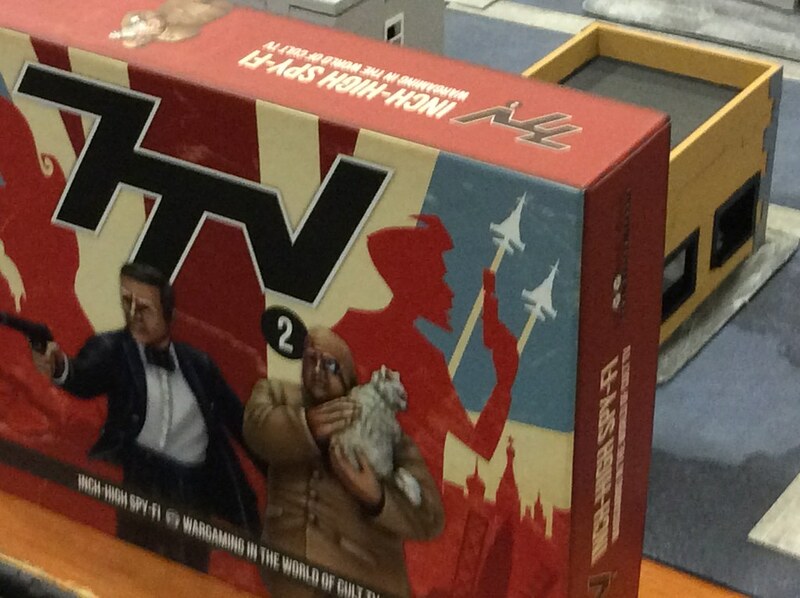 It’s heartening that the big draw for these things still seems to be getting into a decent game. 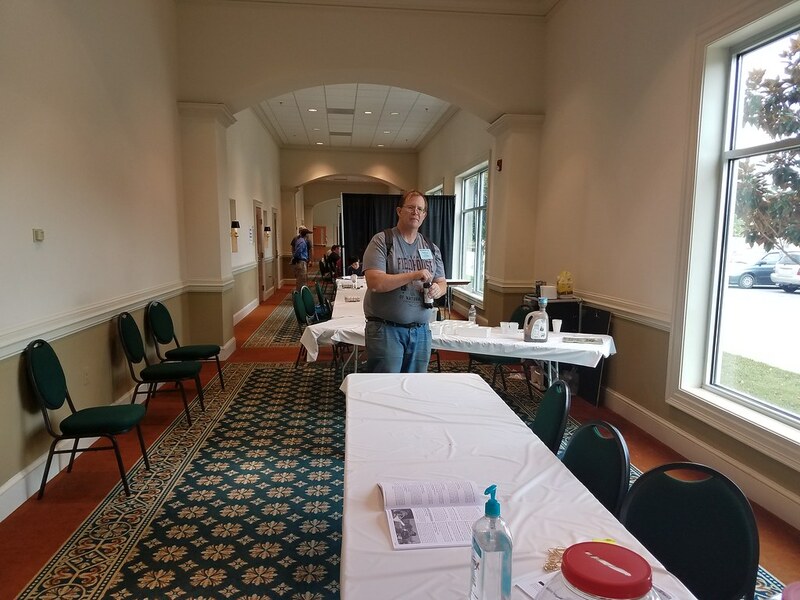 The Fredericksburg Conference Center, for all its flaws (and it has some, to be sure) is at least big enough to hold every game submitted and then some. While we’re discussing convention interface, the Guidebook app was very handy this time around. 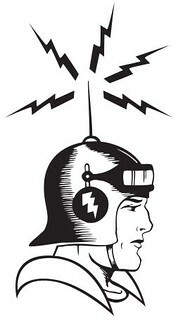 I expanded the social media options and added lists for staff and seminars. It really worked like a charm. Dan Murowski told me the board has approved expanding Guidebook with pay options, so watch out for Fall IN! The Awards Desk gets better every year. 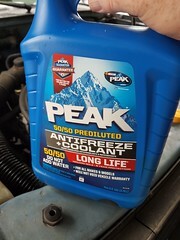 I did a high speed pass by of the Dealer’s area before running out for more COOKOUT libations. 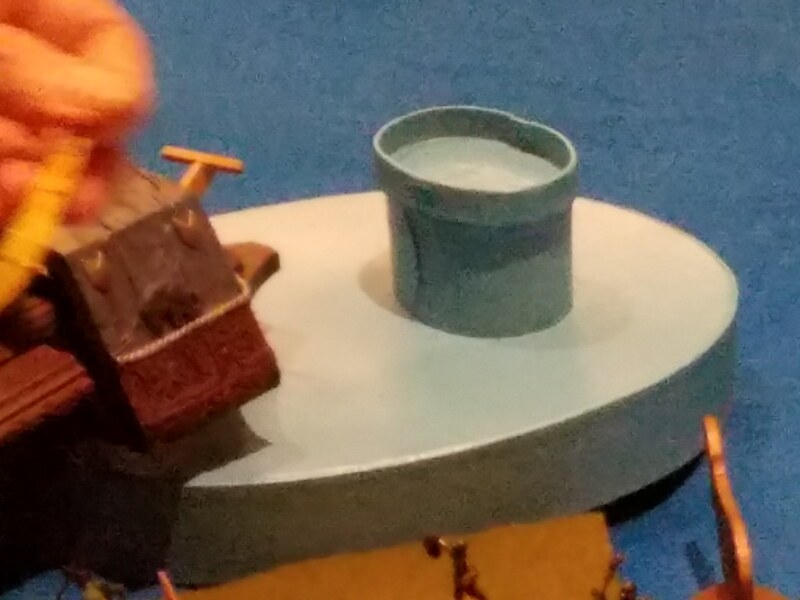 I bought some Pico Armor (I’m remaking the swordfish planes from Taranto) and new Frostgrave stuff. The “big new thing” was a couple of big new things. There was a Samurai warfare boxed starter set.. I can’t recall what it’s called but you get two starter armies in the box. Nice! The other big thing seems to be gangster games– the pump being primed by the release of MAD DOGS WITH GUNS and THE CHICAGO WAY. 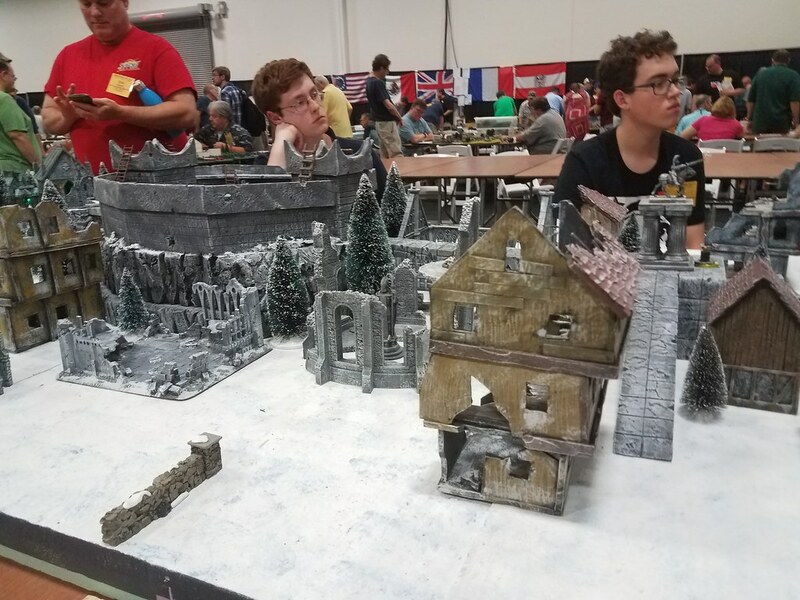 In terms of games being played, I’d have to say that TEAM YANKEE is really catching on with the same folks who like FLAMES OF WAR so much. 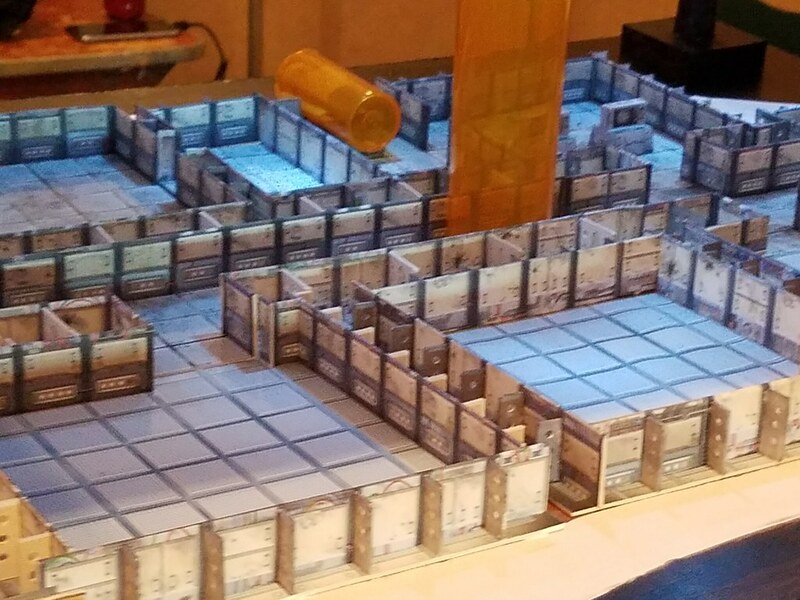 I wanted to get in two games a day at H’con, but really ended up doing 1 a day. My intentions are always good but I was kind of exhausted. 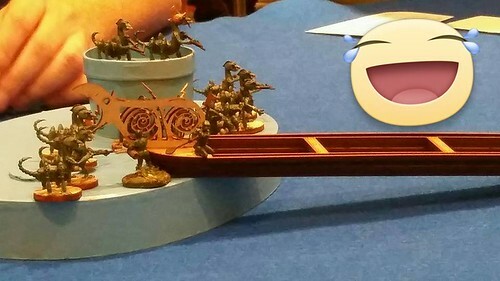 I ended up getting in to Jeff Hiley’s T-574 Frostgrave: Treasures of the Forbidden City game Thursday night and had the time of my life. 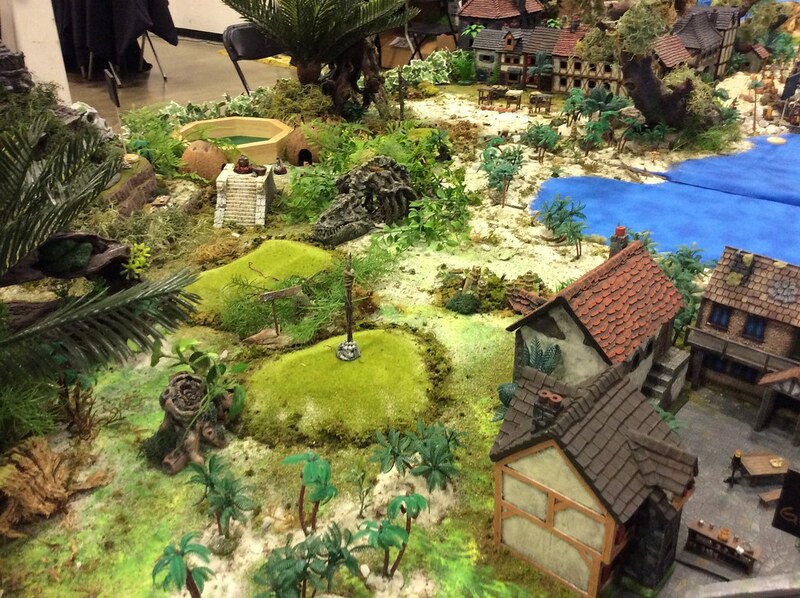 Great terrain, and a great crowd. I’ve broken out an AAR into its own post following this one. I hung out late and kibitzed and chatted with the TNGG crowd in the lobby, then collapsed, woke up to a free breakfast, and went back to it. The vast bulk of games seemed to be running Friday from what I could see. Lines were long and competition fierce to get tickets. There were a lot of good games Friday. I did jump right in to Ed Watts’ game called F-486 Conan, What is Best in Life? 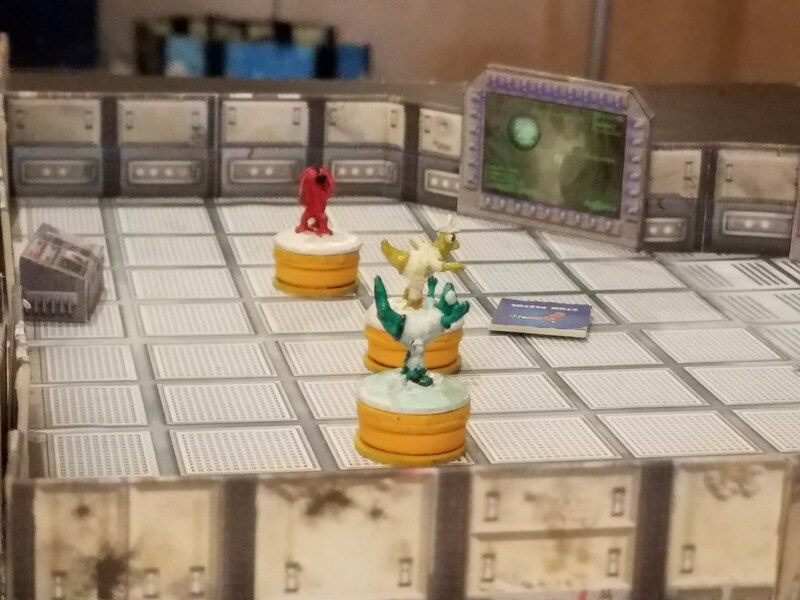 This game was run using the Matakishi Tea House CROM rules I reviewed on here a while ago. I really like the rule set which I wanted to get in to at least one game of before running it myself. 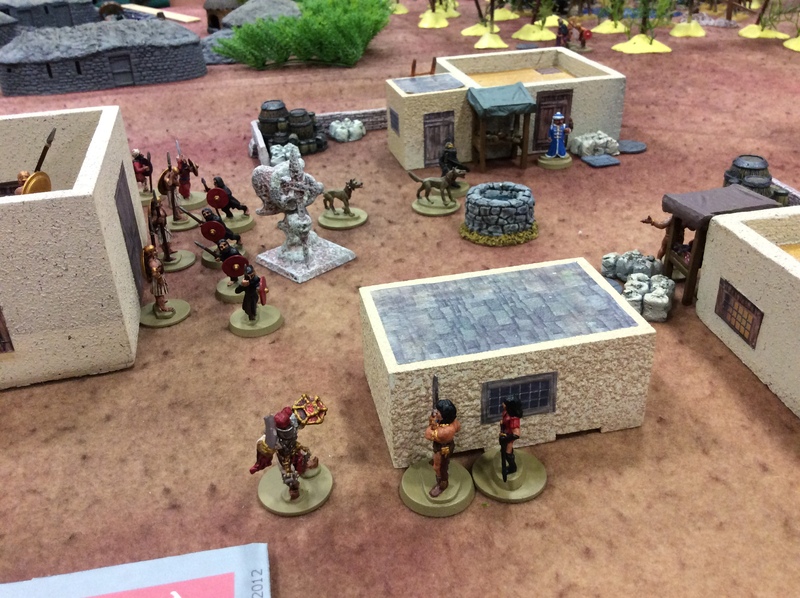 The game had been going on since noon and I showed up late, so I ended up basically running all the roles in Central Casting– the guard commander, the jail house sergeant, the attack dogs, the “other” guard commander. 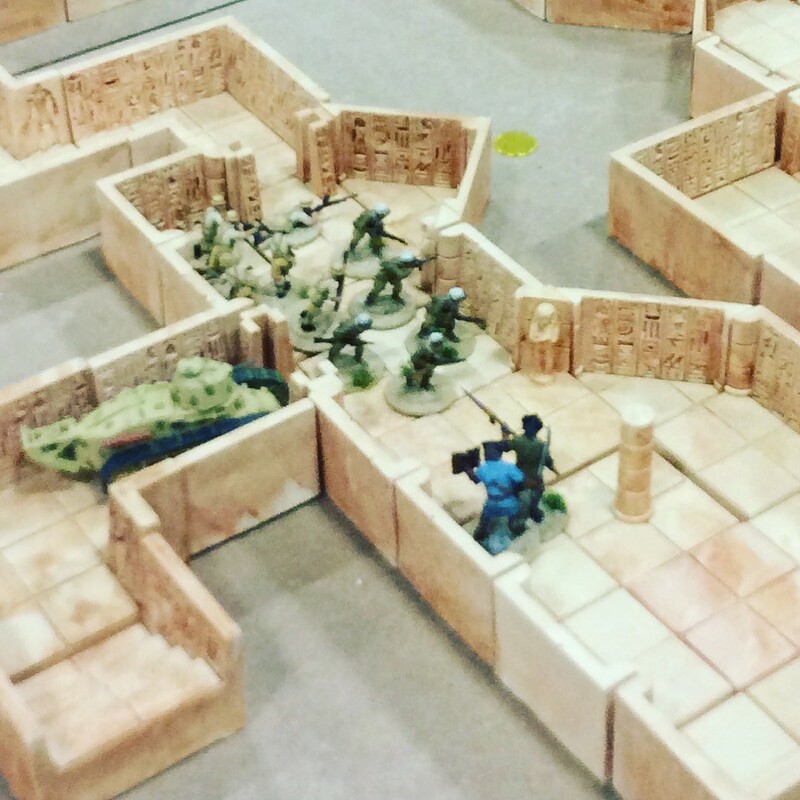 This was my first experience with a larger group of players and a couple of things grew immediately clear about CROM. It’s fun, it’s easy to pick up, but requires to player to make intelligent decisions about how to commit dice from dice pools. That’s what the game is about, at the core. If you’re a heroic character (like Conan, Bran Mak Moran, Red Sonja, etc) you will have a huge advantage. 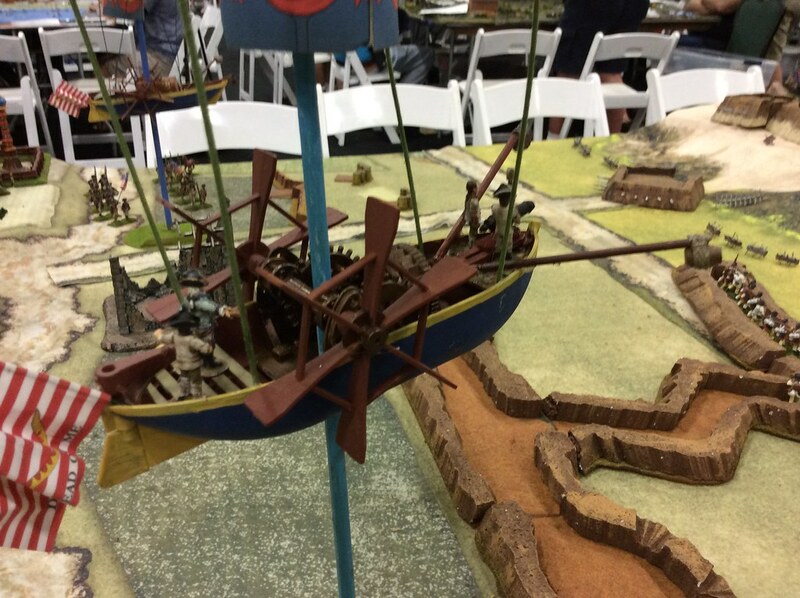 If you are a spear carrier, your game experience is destined to be being part of a human wave that gets chopped up by the heroes. Recommendation: don’t play spear carriers. It’s a great game for all of that. The moment in the CROM game when my “Captain of the Crimson Cloaks” encounters Conan, Belit, and some red haired giant guy. All heroes. They made chutney out of my poor command. Click to see a slideshow of more pictures. DAK and Dragons. 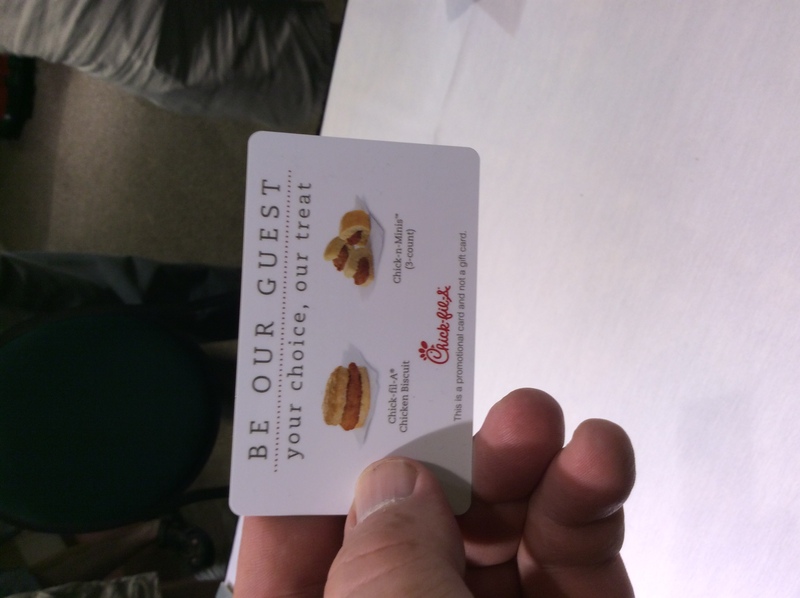 You have to look this one up..
Free Chick-Fil-A? My day is made. Good things are going to happen NOW. I took a LOT more, but that will make this post three times longer than it needs to be, so see the slideshow here. 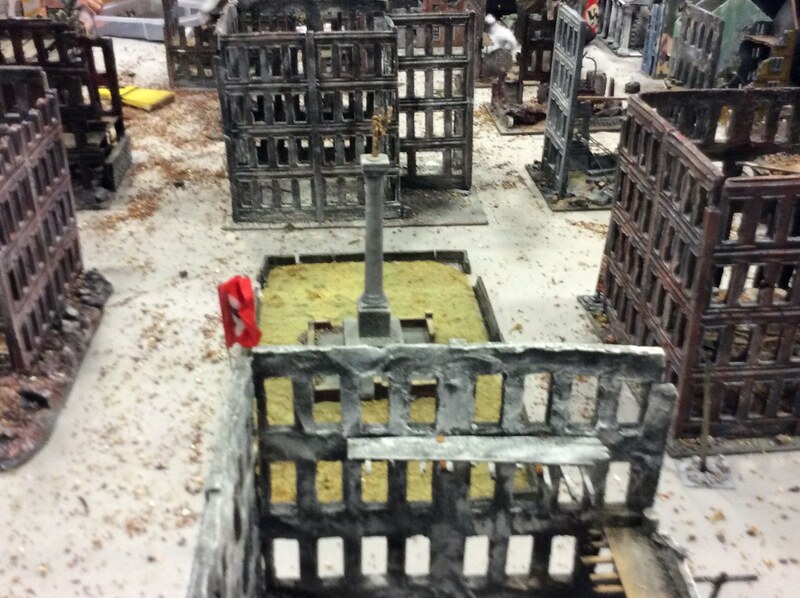 My general observations are that the events I saw demonstrated a superb skill in creating terrain and replicating set pieces from source materials, be they history books, comic books or movies. 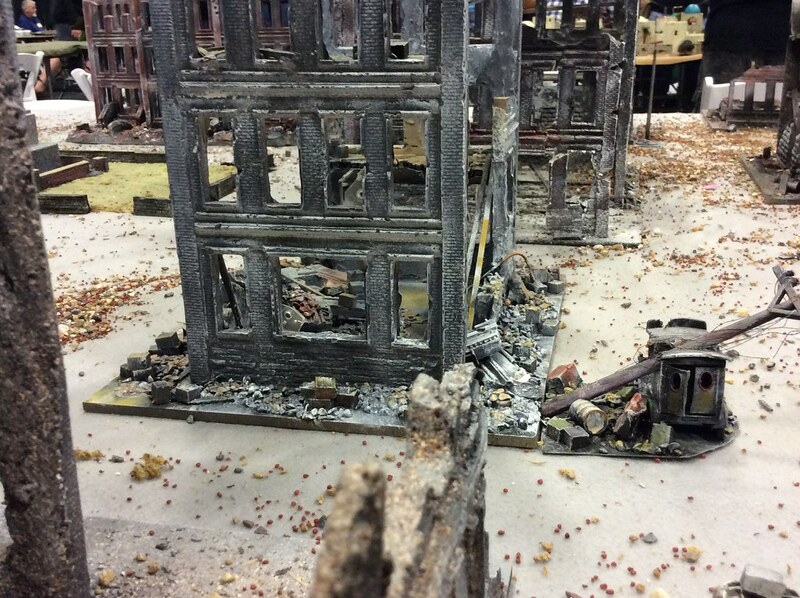 The ruins of Berlin terrain (you can see some of it above) was almost as good as looking at old black and white newsreels after WW2. 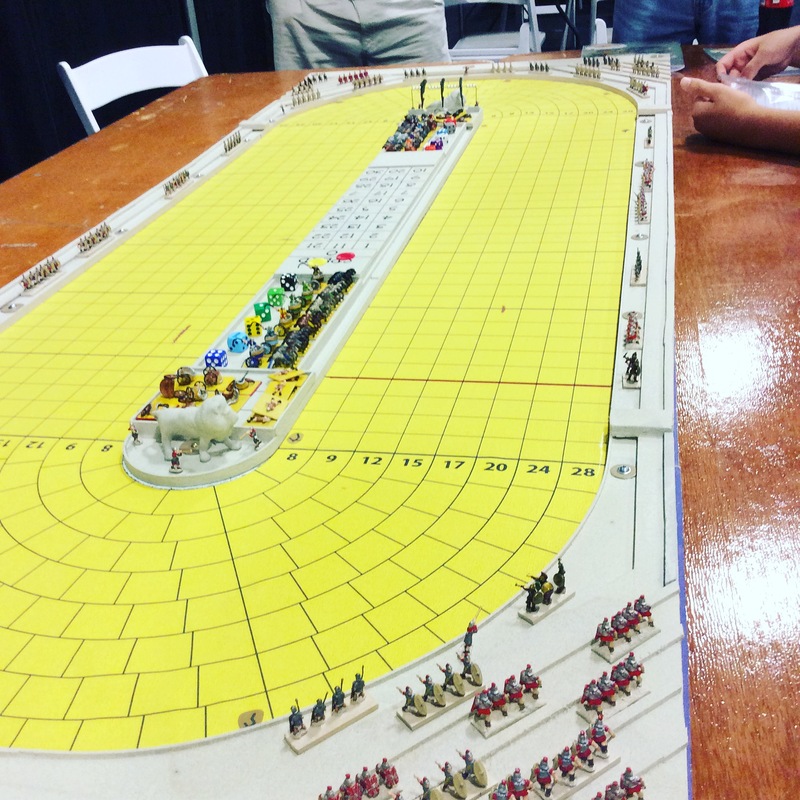 Standouts where the giant 8 hour pirate game that took up a big chunk of space (and a big chunk of Saturday), the 7TV game about Amelia Earhardt, the Frostgrave port city (already mentioned) and the gigantic Team Yankee game in the center of the hall. One thing that I appreciate is that people seem very interested in the smaller concept rules rather than jumping from one full bore expensive gaming obsession to another. 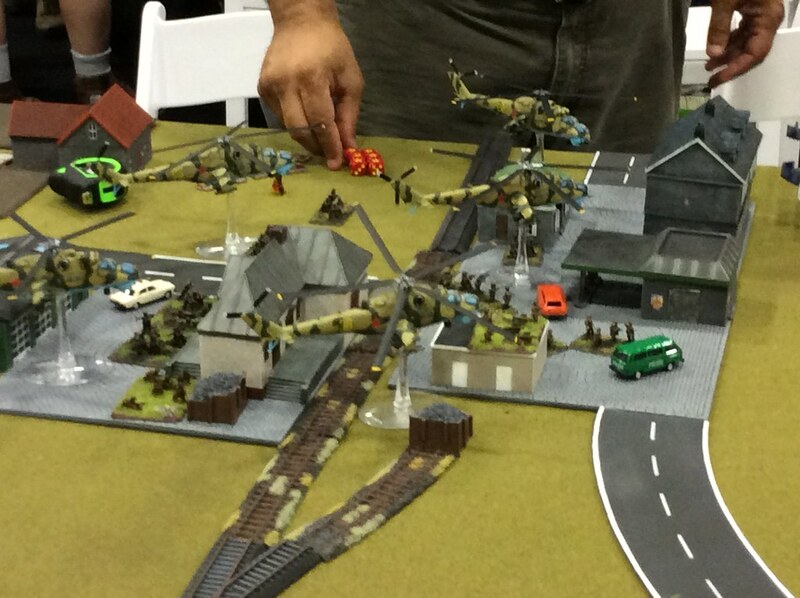 For instance, three years ago, I wouldn’t have dreamed that someone would be running a game about Hyborea as a skirmish game– yet this Historicon had two games of CROM.I was introduced to 7TV at Cold Wars– now it’s an accepted rules set for campy lightly themed SF games. All good things. 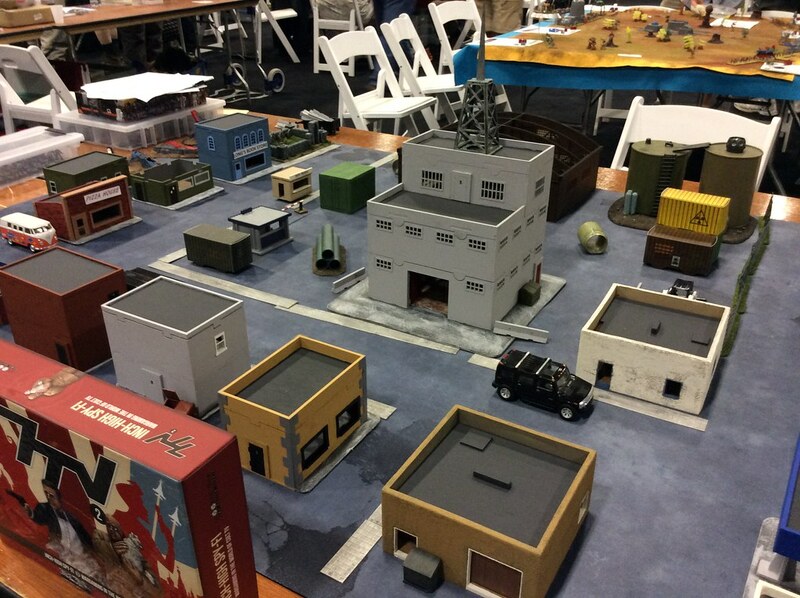 People are starting to discover you really don’t need to have a giant library of expensive stuff to have a great time wargaming these days. Crom and Frostgrave, for instance, can take advantage of the same kind of figures, and you probably have a lot of them already if you used to play D&D. Historical games? The same, only more so. It’s a good trend. So, Saturday… even more people, even earlier working the events desk. We had a brisk trade at the events desk, as Saturday was also very active. We had our fair share of SNAFUs (double bookings, moving games, explaining deleted games, missing tables, misprinted tickets) which we tried to deal with courteously. 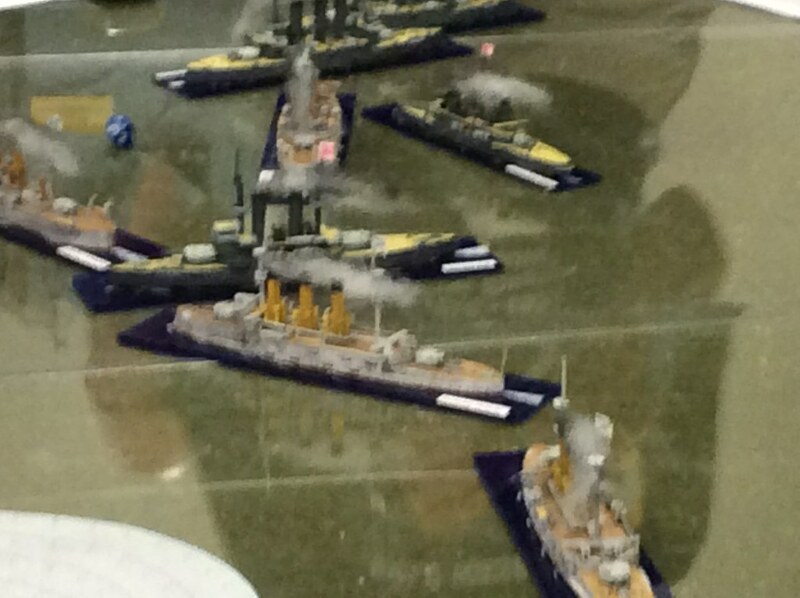 A most excellent Russo Japanese naval game that was ending as I walked up! 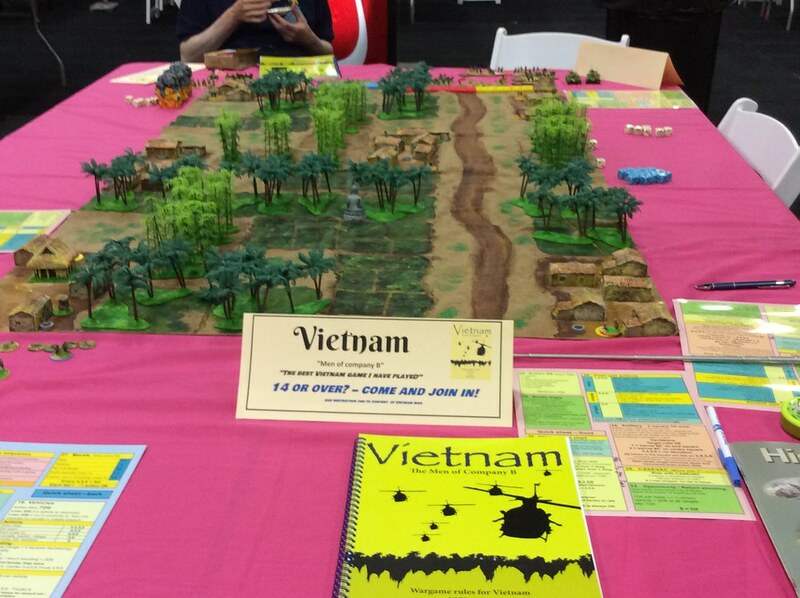 The RFCM demo team was here in force, showing off revised Men of Company B, I expect. 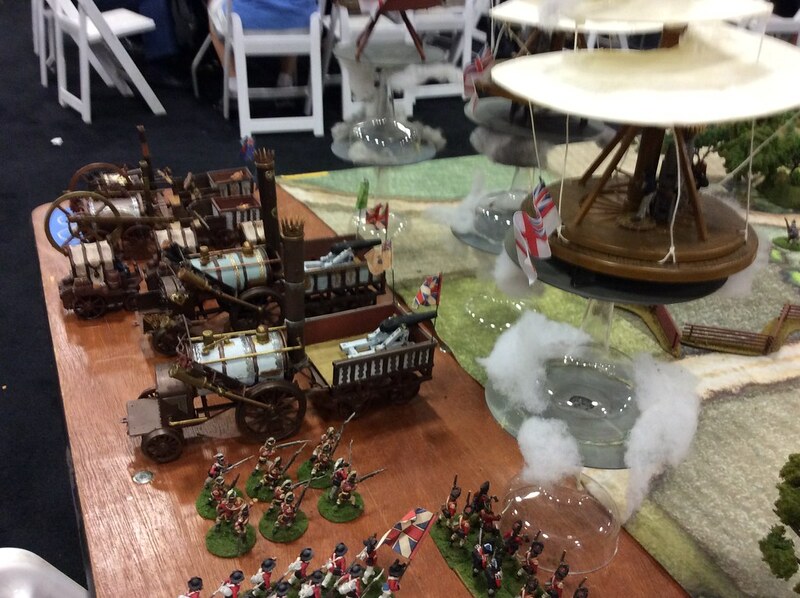 Just one of the many pictures of BEN FRANKLIN’S WAR, a visual treat. What the heck, I know Jeff. the camera loves him. I hope this runs at FALL IN! I’d love to play it. 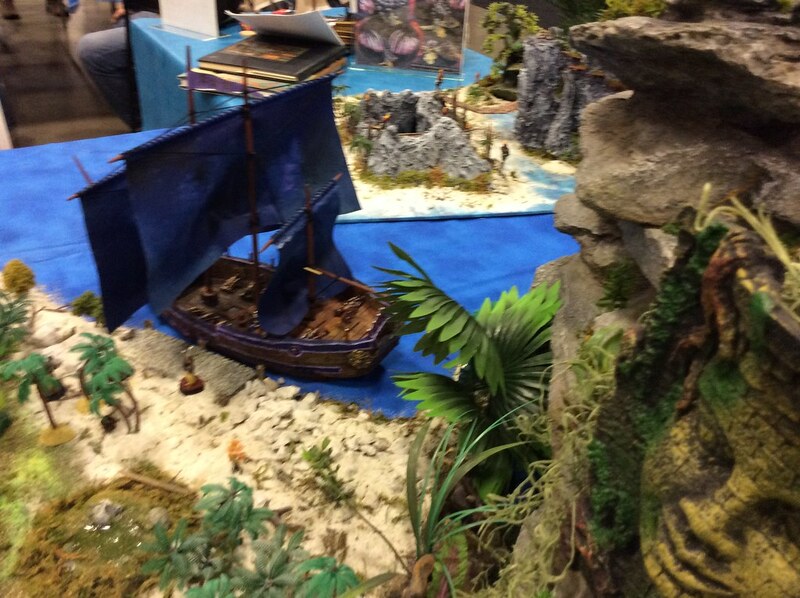 I had a quick run through of the Flea Market and the Dealer’s hall before my 3 PM game, Steve Braun’s Seas of Tekumel. 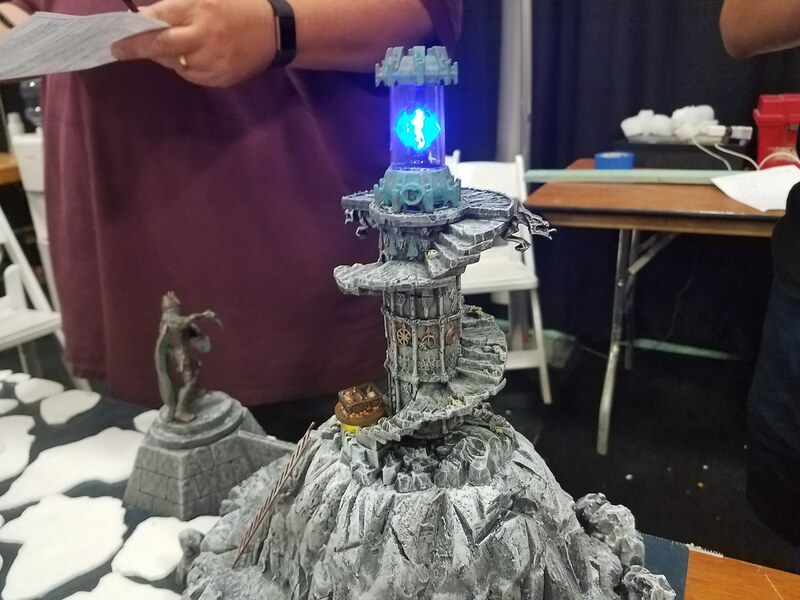 I didn’t buy much, except a light up temple for FROSTGRAVE and some Pico Armor and some old GW troops from Chort, and some laser cut terrain pieces. 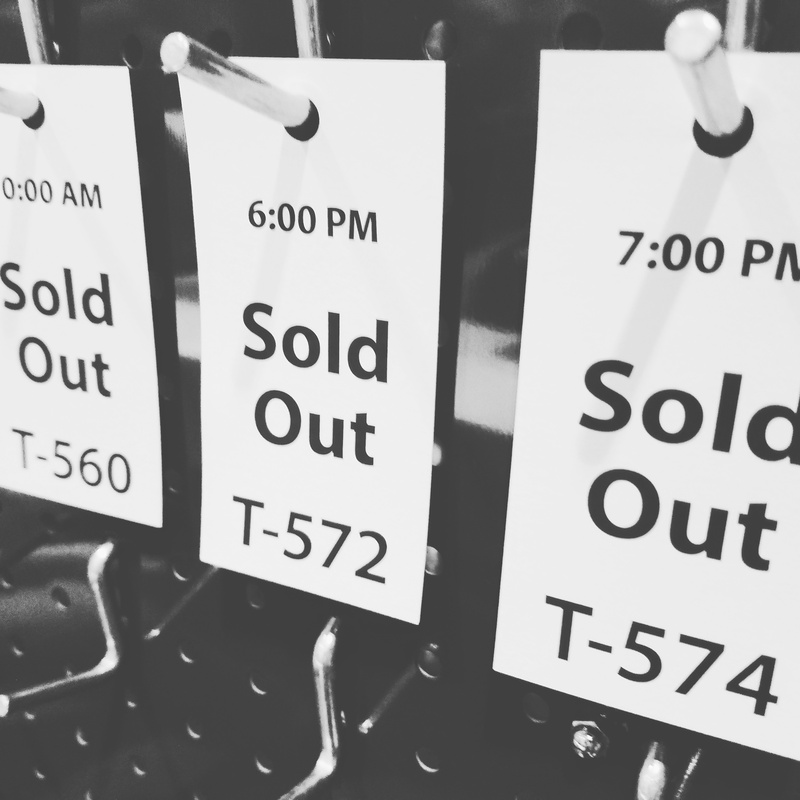 Kind of a slim shopping experience. 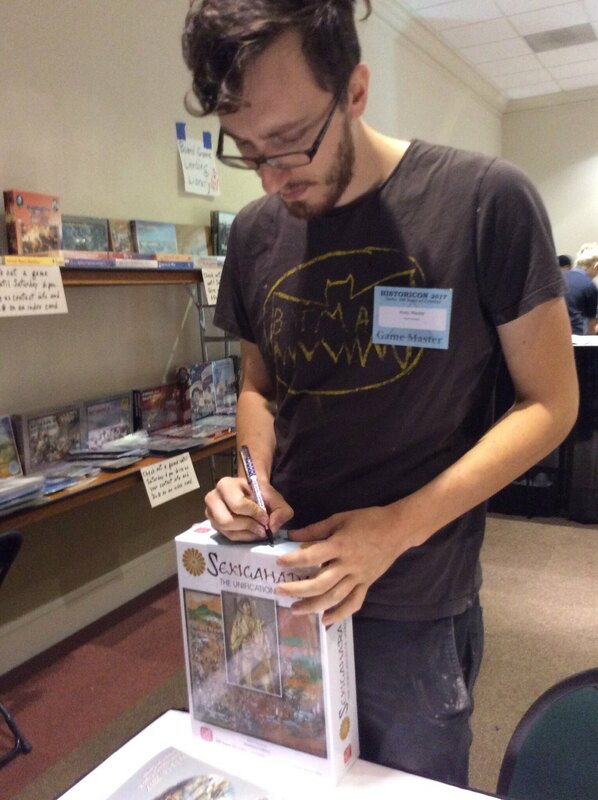 Seas of Tekumel was a reprise of the same game, by the same name, from last Historicon. I once again played the intrepid Xenophobics, the H’luss. 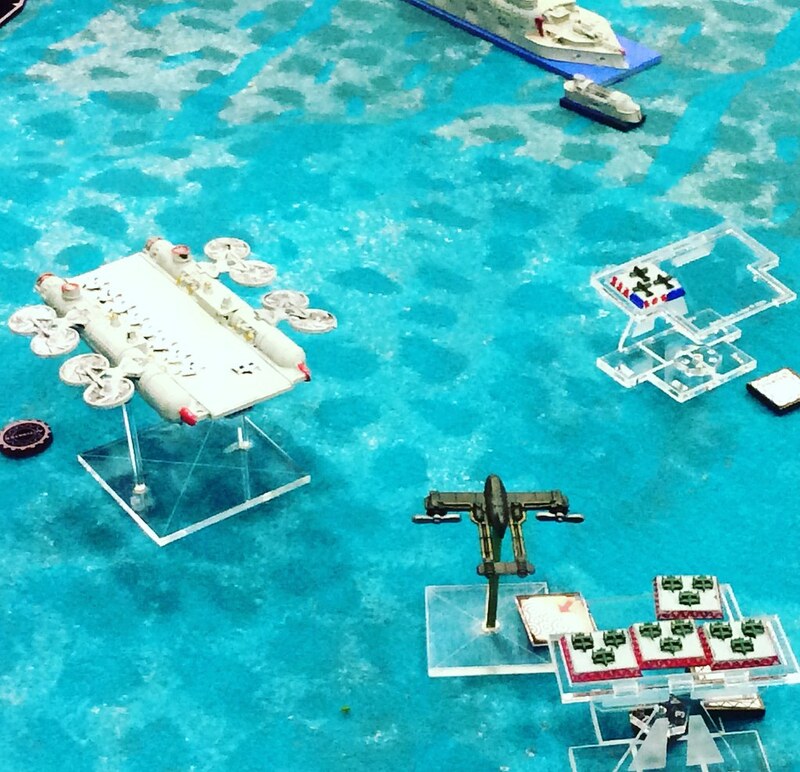 I like playing the H’luss– even if we don’t have the larger crews that the other ships were boasting, we did have the advantage of having the only submersible on the board, an advantage I took advantage of, replaying last year’s nasty trick with less dramatic results. I took more pictures than this, so click on this one to see more. The H’Luss submersible raises underneath a giant frigate to strand the crew on shore. Ha ha ha! I can’t believed they fell for it this year! I wrote another post on this as a follow up; go HERE to see it. My plans were to sit in at yet another game of CROM at 7:30 but this time plans got in the way. I ended up hanging out in the lobby of Homewood suites and playing board games with some fellers. 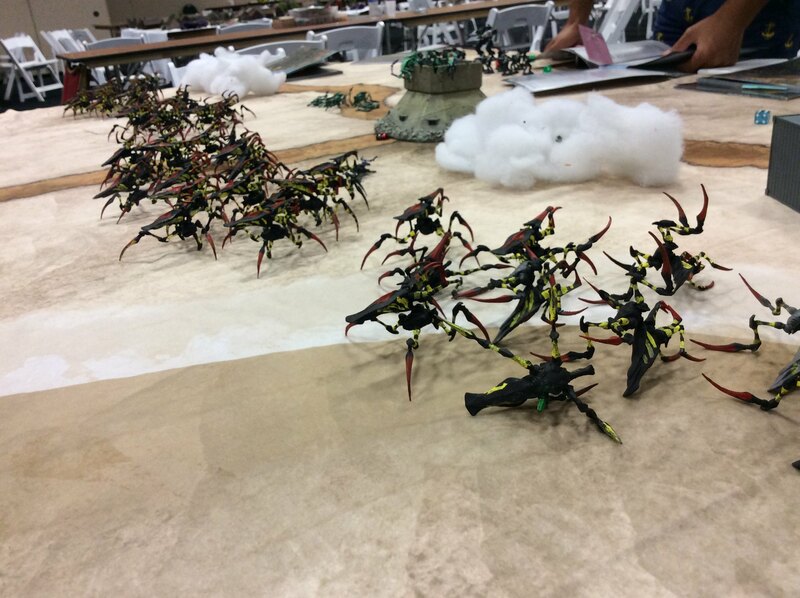 HERE is a slideshow of all my Tekumel pictures. 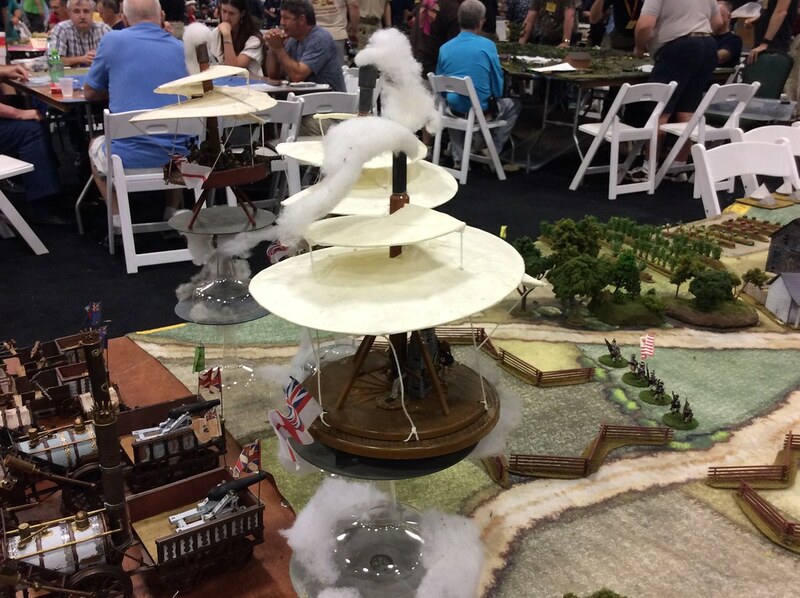 Sunday was like most Sundays at game conventions– breakfast, lots of coffee, a spin around the dealer’s and a spin around the flea. Not much to add. 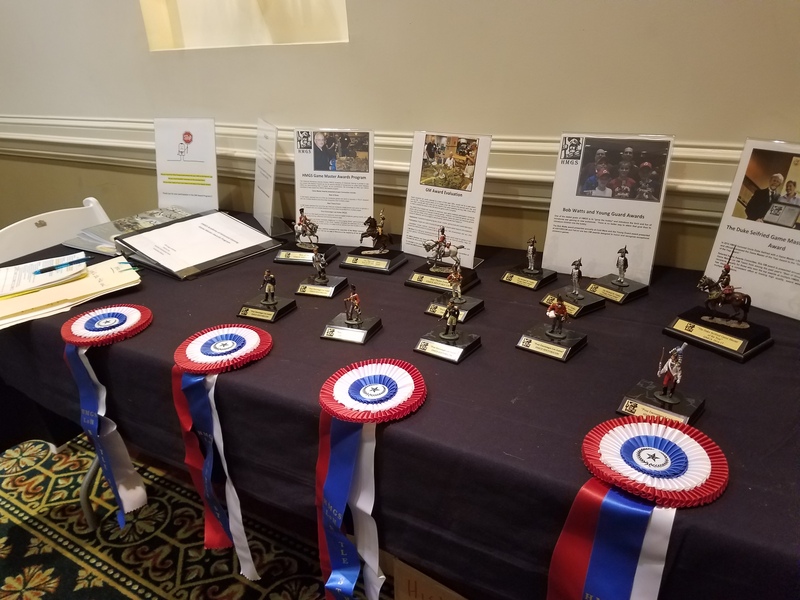 That was my HMGS Historicon Convention, and it was a great time. The weather was quite oppressive at times, and it was a chore to walk across a parking lot in the middle of the day– like being in an Indian Sweat lodge. That part I won’t miss, but like every convention, it was the people who made the difference. I love these cons. Farewell, Fredericksburg! Farewell! (Or at least until the next BoD brings us back). Previous Bow your heads. Dr. Kauderer has exited the building. 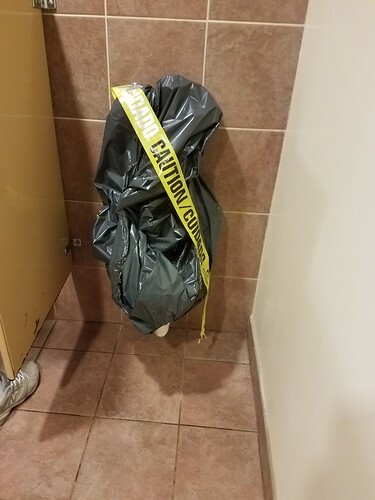 What a great recap (though I could have done without seeing that urinal again). Really glad we crossed paths and that Zach introduced us. Thanks to you and all the volunteers for your hard work and dedication. Without all your behind-the-scenes efforts the convention wouldn’t run so smoothly. We lucked out with the downpour. We’d just sat down for dinner in Park Lane pub when it started, had an extra beer and dessert until it passed. You’re spot on with your comments that Historicon moving back to the Lancaster Host seems like someone getting back together with their crazy ex. Thanks for making me laugh about it, as we’re sorry to see it go.